Since it’s been a short while since I’ve made any new developments on my business card design, I thought I’d pick up the project again with the approach of the new year being a great deadline. 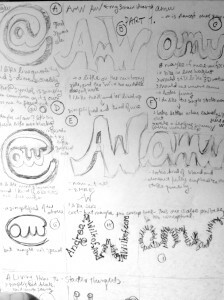 After posting some sketches of ideas I had for a logo, (check here,) I got a lot of great feedback from friends and family; but also it was very varied input on which was the best approach. Feeling stumped, I decided to follow my own advice and move forward in another part of the challenge: the over all design of the card. I was doubly motivated when I found this free Skillshare class. Almost like magic, my brain made some decisions about the logos I had produced and I jumped back into the boat to finish streamlining logos. I have it down to two winning ideas shown below. Ignore the layout (my name is simply a place holder,) and focus on the logos. Deciding between 1 and 2. Stay tuned for drafts of the full card layout to see which one I’ve chosen! This entry was posted in Uncategorized on December 18, 2013 by How2Girl. Don’t stay off. Find a way back on, or build a new one. This entry was posted in Life on December 11, 2013 by How2Girl. With the economy and world the way it is, there’s been a lot of chatter about what it means to be a Millennial. But it rarely seems to come from anyone in this said generation. Let’s start with some delineation: what does it mean to be a “Millennial”? The ever truthful and occasionally reliable Wikiepedia claims that, “Milliennials, or the Millennial Generation, also known as Generation Y, are the demographic cohort following Generation X. There are no precise dates when the generation starts and ends. Commentators use beginning birth years from the early 1980s to the early 2000s.” This is a self-admittedly broad definition connecting mostly to a fuzzy time frame; also, not what all the buzz is about. Many of the articles discuss our* generation being labeled as “lazy” or “entitled,” while others acknowledge the complexity of the time. The debate seems to stem from everywhere, and unsurprisingly friends and family from many different generations bring it up often. Disregarding labels, every generation feels the need to prove itself worthy to the generation prior one way or another. Why? Because we tend to expect only what has already been seen, and thus new roles are always the most challenging to foresee. My favorite example that comes to mind from a previous era is the now renowned F. Scott Fitzgerald’s The Great Gatsby. The nouveau riche and opportunities for reinvention were looked down upon by old money, aka, the previous generation. Gatsby was a metaphor for anyone who took the system by the reins and exploited it’s weaknesses, aka, the prohibition etc. Again, those with ties to inherited or traditionally earned wealth peered down their long noses, almost egging motivated characters to show off their wealth via opulence. This is just one of many themes that identify the conflict between the “new” and the “old,” and though completely different from today, bear a striking resemblance to some of the patterns to what I experience and witness. Many of our parents came from nothing, which motivated them to work hard to climb upwards and become something. And since many (again, this is a generalization, I think immigrating families all have some version of this experience in any time period,) of our parents have raised us without that need. Instead they have instilled a drive within us to find a career that “makes us happy.” This is a much broader goal than “earn money,” and in a way could be considered entitled thinking as we [thought we would] have the luxury of time and support to help us find this path. In the end, we are not lazy though. We graduated college expecting a degree in something, -anything-, and believed that would be enough to get us a decent job. For many of my friends (and myself) at least, when our first choice career did not come easily, we were ready to settle for anything that would allow us to be independent WHILE following our dreams. Though I can’t speak for everyone, I know of so many examples of friends who are working 2-3 jobs to pay for rent just to move out of their parents’ homes and aim for independence. In most cases, at least one of the jobs taken is an unpaid internship or other low-wrung stepping stone to our dream careers. But even surviving on this combination can be a challenge. Please understand, no one lives at home because it is their first choice. No one, (except possibly in extremely rare cases,) loves living at home with their families; if you are living with your parents, I bet you are doing whatever you can to move out, no matter how much you love them. If any one of us started off feeling entitled, the majority of us found out quickly this would not be true after receiving our degrees. Instead, we are anything but lazy as the numbers for highly educated people take lower and lower paying jobs. Lines for separating these generations aside, I am deeply curious about what great expectations the next generation will face, how they will be mislabeled, and how they will fight back. Good luck Generation Z! *I consider myself a Millennial and loosely am speaking from that perspective, thus I am choosing to use the royal “we” in this context. **I lump these two together because they often land on the same line when one searches (as I have) for “Millennial” on Google. This entry was posted in Uncategorized on December 7, 2013 by How2Girl. Branding is key, and having a strong logo makes sure your audience knows which door to open to find yours. With this value in mind, I am starting with designing a logo for my business card. By beginning with this, I can spend the week refining the image while I continue to develop the other aspects of the project- since most of them are much more cut-and-dry. 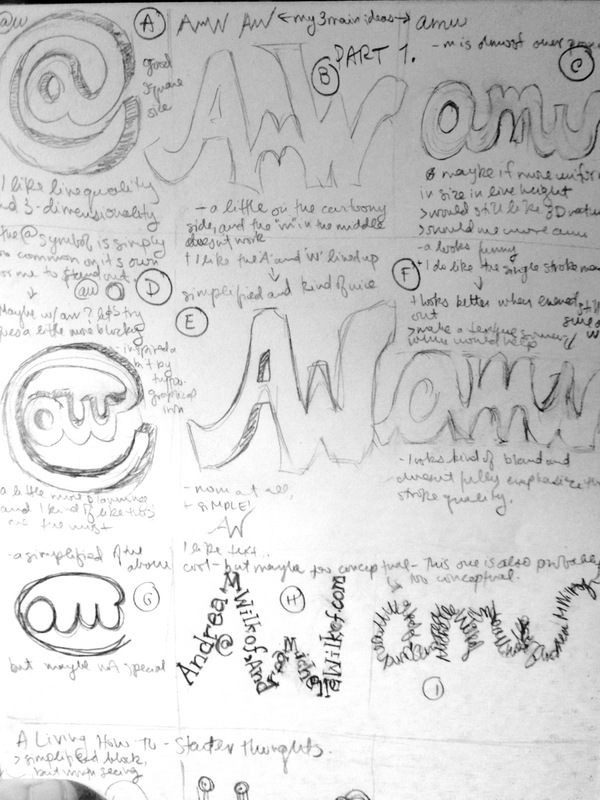 Here are nine very casually sketched logos, using my initials (AMW and AW). 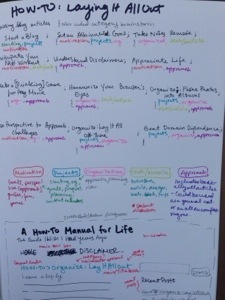 From personal and external feedback, so far I am leaning towards a second generation of 2 main concepts evolving. Specifically, combining D and E, as well as creating H on with typed text and possibly having more than one line of text per stroke. Here is where you come in: what are your thoughts on the above 9 logos? Leave your feedback in the comments and stay tuned for tomorrow’s turns. This entry was posted in Uncategorized on December 4, 2013 by How2Girl. Therefore, I am using this blog to teach myself and others how to make a business card. That is where you come in: you, the internet community, are endlessly wise and filled with particular skill-sets and particular opinions. For each day of the next week to come, I will write about and work on one more step of the creation of my personal business card, and ask for your help, through feedback in the comments below, along the way. So let’s get started! Since today is Sunday, it’s a good day to design my game plan for the week ahead. The following are a few ideas of elements I want to focus on divided up into 5 categories. What do you think? Is there any part of the business card creation process I’ve missed? Do you have any websites or ideas of where one might start along this process? Tomorrow to start, I am plan to sketch out 6 potential logos and ask you the reader to vote on a favorite. Stay tuned and feel free to bug me about how far along I am in this process. Let’s all learn together! This entry was posted in Uncategorized on December 2, 2013 by How2Girl. Passion is a double edged sword: while you get to use it to complete tasks relating to goals you like, it almost detracts from other areas of your life you may wish to have equal motivation for. This spread of energy can be identified as a form of Domain Dependence*. Domain Dependence is what makes categorizing your music collection fun, but organizing files for a presentation tedious. If you aren’t getting an immediate positive emotional pay off, the cheese at the end of the maze may seem too far off to even elicit the desire to continue. The answer? : Find elements of your tasks you enjoy and bring it to tasks you dread. When I began on my mission to organize my wardrobe, I immediately knew I’d have more fun if I got to draw them out, and think about the value of colored lines along the way. (See an example here.) I’ve been enjoying myself so much, I have begun to work on this as a procrastination project. 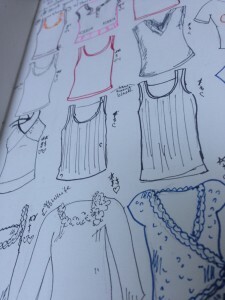 Often I will pick up some clothes to fold and mark down instead of thinking about this blog and how I can develop it. While searching for ways to motivate myself to really think about how I want to lay information out, I realized I should treat topics for discussion in the same way I’ve been laying out all the clothes. I had a major case of Domain Dependence in being unable to apply similar skills to different projects. Using bright colors, I followed my own advice and laid it all out on paper to assess where I came from and where I want to go. I already have some better ideas and motivation to look up the anatomy of a wordpress page so I can figure out how and what I want to change! This entry was posted in Organization and tagged colors, games, org, organization on October 10, 2013 by How2Girl. The first step to any organizational process is to know your materials. Our minds are amazing organs, but they estimate based on our previous experience, regardless of the reality. I am always surprised to see the difference between what I expect to see, and what the content reveals after all the pieces have been played. Whether you are working with physical/e-files, bookmarks, business cards, boardgames, or your aunt’s collection of tiny frog-related tchotchke; you will have no idea what categories or larger groupings to create if you haven’t documented the material to be organized. Taking an inventory might sound potentially boring, but this is the first opportunity to turn the process into a game. There are an infinite amount of ways to lay out/inventory your stock. In fact, I might even call this “info graphic brainstorming” time. To help develop my sense of style, I have decided to organize my wardrobe. I could lay out all my clothes and work with arranging them in physical piles, but where would the fun be in that? 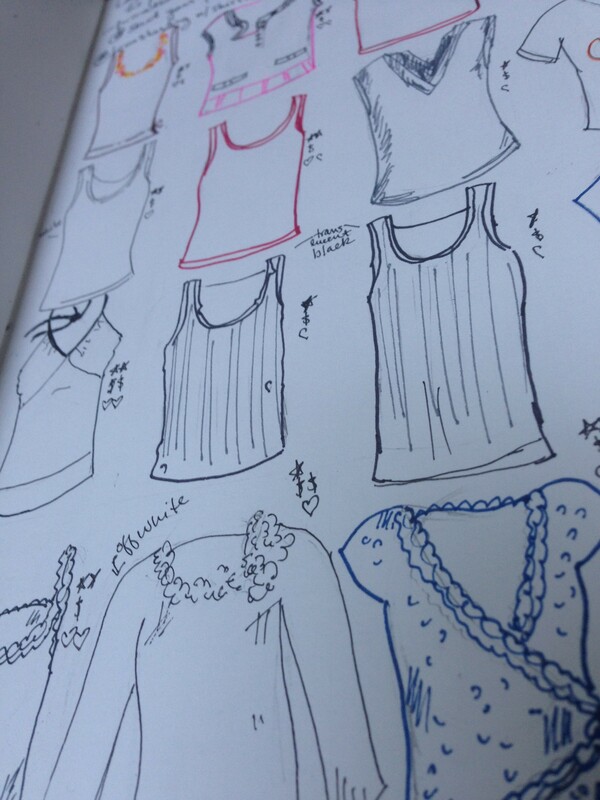 I love to draw, and have always thought fashion illustration was cool; how about I try to do crude line art of my clothes? I have started with my shirts, (the most popular/trending content,) and have since gotten about 25 on one page. I will continue to post progress with other tips about how to get yourself organized, so stay connected! This entry was posted in Uncategorized on October 4, 2013 by How2Girl. I often find myself looking so closely at dilemmas, they become walls that block my view of everything else. Studying it searching for a weakness or simply a way around the block consumes me while I forget that most problems are just pieces of larger ideas and objectives. Taking a step back can feel like reverse-progress, but pulling back can enhance how you look at an obstacle. The next time you find yourself frozen in action, consider heating up your momentum with the following tips. Re-examine another issue to fix. Averting your attention to a different (but ideally related) problem will give you more peace of mind, show you a new tool to defeat the wall, or may even show you an error you can fix to change the whole foundation of the situation. Remember why you started. Your motivation is your energy bar: the more real the need for you to pass through, the harder you will work to find a way. Find an easy task to relax with. Small but helpful tidbits can be extremely satisfying as well as boost your confidence. You just organized all of your receipts, you can now organize the world! In the end, the smaller the wall, the easier it is to kick over. This entry was posted in Uncategorized on July 17, 2013 by How2Girl. Plug in your camera-phone to your computer and you may be prompted with photos going back as far back as your first iPhone. Anytime I plug my iPhone in to charge, a window pops up to share photos with me that I took dating all the way back to 2008! As an artist who finds beauty in everything, it turns out I have more than 1,000 photos of every random flower, sunset, and tasty food I felt inspired to capture. Take a photo, save a memory. But how and where will you know to find each moment? And what about all the 10s of duplicates or misshots that seem to just be taking up space? Thank Tech there developers have been adding more and more ways to organize the plethora of photos we accrue into folders, or in Apple’s case: albums. Open the Photos app, and enter into your albums page. Ensure you are in the Albums section by tapping the Albums emblem on the bottom of the page. Funny things may happen if you are operating in the cloud of Photo Stream. Tap to open your Camera Roll. The Camera Roll stores ALL of your photos, from legacy and last-taken. Unless they are also in your Photo Stream*, deleting a photo from the Cameral Roll will remove it from your camera completely. Tap the Edit button in the upper right-hand corner of the screen. Select one to any amount of photos to select them. Multi-selecting allows you to pre-create album groupings. If you know in advance how you want to organize the set, you can select only the relevant photos, and add on more later. Tap to select the final confirmation, and you now have an album of your own creation. Note that even when you forge new folders, the original photos still exist the confines of your Camera Roll. Albums can be mighty handy when you want to share specific sets of photos with your friends via email, slideshows, or to your webpage. More tips and instructions for fast photo faring soon to come! *The Photo Stream is Apple’s cloud storage for your photos. Photos taken when you’ve enalbed Photo Stream will remain live and accessable on the cloud even when you delete them from the Cameral Roll. **I hate ending with a proposition, any ideas on how I could rephrase the sentence to arrange otherwise? Thanks! This entry was posted in Tech and tagged iphone, photo on July 10, 2013 by How2Girl. Saving successful, helpful, or otherwise generally cool websites is one of the advantages of the internet: highlighting the good stuff to come back to later. But what happens when you forgot to send yourself a link while at a friends? Not to mention easily sharing all of those links with your work computer… ” Enter one more neat Cloud accessory that will save you some angst. Currently there are many different ways to save information that you will find valuable later: from syncing your devices directly to programs like Pinterest and EverNote that you can view from anywhere with internet access. I have found that the most convenient (once properly set up) is to use Chrome universally. Chrome uses GMail accounts to harbor all your data, so once you log into your GMail account on Chrome, the feeling of safety will wash over you almost instantly. Choose of your one Gmail emails as your “browsing account.” Don’t deny it, you have at least 3 emails. The key here is to log into any browsing, bookmarking, or tabbing consistently with the same account. Chrome has a ton of helpful information to help you log in from any device that you can find here. Download the Chrome App for your mobile device. When prompted, log into your Gmail browsing account. Make sure tab syncing is enabled. Use the 3 buttons on the bottom to to navigate through your recent mobile history, bookmarks, and desktop/other Chrome App tabs. Tapping the Star button on the bottom lead directly to “Mobile Bookmarks” which threw me off for a second. To get back to the main bookmarks tab, tap the Bookmarks text on top. 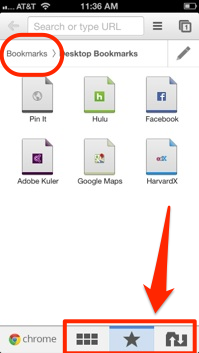 Note: When operating Chrome mobile, any new bookmarks will be saved in this new auto-organized ‘Mobile Bookmarks’ section. Accessing tabs on your other devices is just as easy. Simply tap the Sync Tabs button on the bottom right and a beautiful list of anything opened on your account will pop up. * Also helpful is the ‘Recent Tabs’ button (the little grid-guy to the right of the star) because it reveals your most recent closed windows. Never leave home without your history again! *I can only imagine the parental and partner tracking that can be sourced from all this Clouding around. The above article is a summary of the chrome instructions found here. This entry was posted in Tech and tagged bookmarks, chrome, mobile, sync, tabs on June 30, 2013 by How2Girl.